Given the way the 2007 season turned out for Anthony Bertozzi, he should think about taking it easy more often. That's because even though the he followed through with his plan to spend a large portion of the summer relaxing in Virginia Beach, Bertozzi, 41, still managed to pull off a rare feat by capturing both the Stock Eliminator and Super Stock IHRA World Championships. No one has ever won both the Stock Eliminator and Super Stock championships in the same season before, but 2007 was the fourth time that Bertozzi has won two IHRA championships in the same season. 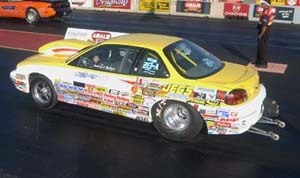 In 1996, 1997, 1999 and 2000, he won the top honors in both the Super Stock and Modified Divisions. 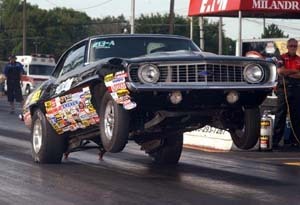 Including the two championships he won in 2007, Bertozzi has won 16 IHRA world championships and one NHRA championship. "I loved the old Modified division because that was a non-electronics class," he says. 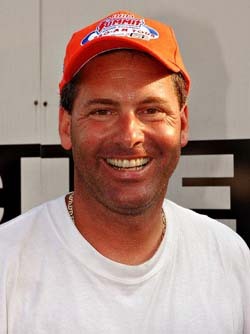 Bertozzi was the IHRA Modified champion in 1994 through 1997 and again in 1999 and 2000. IHRA dropped the Modified division from its championship slate after the 2002 season. Though he intentionally chased the championships in many of those years, this year was different, Bertozzi says. "Two seasons ago, my wife and I were talking and we decided to take some time off in the middle of the summer and spend some time at the beach," he explains. The Ashland, Virginia couple own a house in Virginia Beach. So when the season started, "I was not going to be chasing points," Bertozzi explains. "I've been chasing points since 1991." Bertozzi in his Super Stock car. Part of Bertozzi's plan for 2007 was to hit as many races as he could in the beginning of the season, then take most of the summer off. That meant that the first races of his season would include the NHRA national event in Gainesville, Florida and an IHRA points race in Bradenton, the week before. "It was too cold to go to the beach, so we decided to go race in Florida," Bertozzi explains. "We raced every weekend until it was warm enough to go to the beach." After recording several wins early in the season, Bertozzi says he began to think he could win a championship and take time off to spend at the beach. "I said 'Let's got to Douglas (Douglas Motorsports Park in Douglas, Georgia),'" Bertozzi says. "I knew I would be pretty much guaranteed to win the division just by slowing up." 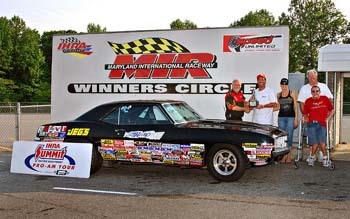 After he won both IHRA points races at Piedmont Dragway in Piedmont, NC, Bertozzi began to think of the championships in both Stock Eliminator and Super Stock. "That gave me five division wins. That's when I thought I had a shot at winning both classes," Bertozzi says. Bertozzi in his Stock car. Even though he had several early wins and thought he had a good chance to win both titles, Bertozzi knew that things still had to fall his way. On one weekend, there were points races in both Ohio and South Carolina. "Everyone who was close to me in points won that weekend," he says. "After (Michael) Beard won in one race and was runner up in the other, he had a chance to get by me." With the championship almost in hand, Bertozzi decided to take a one-weekend break from his summer vacation and go to the IHRA national event in Milan, Michigan so that he could take a step closer to clinching the Stock Eliminator and Super Stock titles. But the weather did not cooperate with Bertozzi's plan. "It rained there, so one weekend turned into two," he says. But even though the Milan race proved to be one of the most pivotal points in Bertozzi's season when he won both the Super Stock and Stock Eliminator. In the Stock Eliminator division, Bertozzi was in a close race for the championship with Nick Folk, when they met in the second round of eliminations. Bertozzi and crew celebrate win. "I was in the lead," Bertozzi recalls. "If he had won, he would have passed me in the points." But. Bertozzi had the quicker light at the starting line and went on to win not only his third round race against Folk, but the event as well with a final round win over Bob Marshall. Just a little while later, Bertozzi took the Super Stock title at Milan with a win over Michael Lyons in the final round. "When I left the Milan national event, I felt I had a good shot at both," he says. When he is not drag racing or relaxing at the beach, Bertozzi runs two family businesses in Virginia. One is a building supply company and the other is a drywall installation company. "My grandfather started (the drywall company). It was a plastering business when he started it," Bertozzi says. "Now I have about a hundred employees." Key among those employees is a manager who helps run the company and gives Bertozzi the ability to get away from the business and go to the racetrack. "My father and I ran the company for a long time," Bertozzi explains. "When my father passed away four-and-a-half years ago, I hired a manager." Like many racers, Bertozzi works to make his drag racing effort pay for itself, rather than fund his program with his own money. "I've made money in racing about 95 percent of the time I've been doing it," he says. But, he says, he has no desire to become a full-time racer. "I don't like racing for a living," he says, adding that drivers who depend on their winnings for their income face pressures that can take the fun out of racing. Several years ago, when his father was still alive, Bertozzi considered becoming a full-time racer. Bertozzi says he told his father what he was considering and his father told him that if racing full-time was what he wanted to do, he should give it a try. "I thought about it," Bertozzi says, but in the end he decided that racing for a living was not something he wanted to do. "I don't want to race for a living. When I'm at a race, I can go out to dinner on Friday nights," he says, adding that some of the full-time racers he knows don't have time to spend with friends because they are two busy trying to earn money at the track. Though he does not race full-time, Bertozzi says no one should think that means he is not as competitive as those who do. "I want to win as much as the next guy," he says. But his desire to win has its limits. "I could go out and buy new cars every year but I've never been like that," Bertozzi says. "I try to make (racing) pay for itself." And, he adds, there is really no need for him to buy a new car. "My cars still work well." Like many racers, Bertozzi got his start competing as a bracket racer at his local tracks. 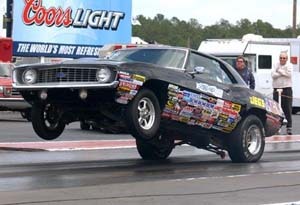 When he started to compete at IHRA national events, some of his fellow racers began to call him a "TV racer," he says. "They'd say 'Why are you going to that national event? To be on TV?'" Bertozzi credits his bracket racing experience with his early success on the IHRA circuit. "It's hard to beat seat time and experience," he says, adding that bracket racing is a good way to build both. While Bertozzi has been very successful behind the wheel, he readily admits that he is not as comfortable under the hood of his racecars. "I'm not much of a mechanic," he says. "I like racing the cars." Instead, Bertozzi leaves the task of keeping his 1969 Camaro Stock Eliminator car and 1998 Pontiac Grand Am Super Stock racer to crew chief Rodney Eades. "He keeps the cars up and gets them to the track," explains Bertozzi. "I couldn't do this without him." If it were not for Eades' dedication to racing, Bertozzi may well have had to figure out how to race without his crew chief. During the summer, Eades broke two vertebrae in his neck, but tried to put off much-needed surgery until after the season was over. "He needed surgery but he told the doctors 'Not until the end of the season'," says Bertozzi. "He is 100 percent dedicated to racing." Eades put off neck surgery for most of the remainder of the year but finally acquiesced to his doctors' recommendations and had the surgery before the season finale at Rockingham. Bertozzi's wife, Malinda, is also a regular at the racetrack. But she is not there just to help out. 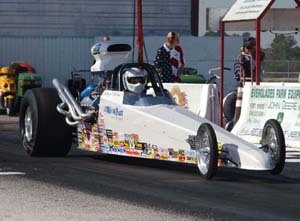 Malinda also races in IHRA's Top Dragster and Quick Rod divisions. Bertozzi says that because his wife also enjoys drag racing, it makes it easier for him to enjoy his racing efforts. "I wouldn't want to see my wife just three nights a week," Bertozzi says. "I she didn't enjoy racing, I don't know what I'd do." 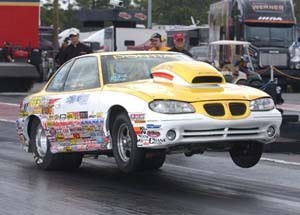 While both Bertozzis have been successful on the track, they do differ on their goals in drag racing. "She (Malinda) wants to race Top Fuel," Bertozzi says. "If she can make it happen, she will." As the first step to making her dream a reality, Malinda is planning to get her A/Fuel license at Doug Foley's drag racing school, Bertozzi says, adding that he has no desire to drive the 300 miles per hour racecars. "I just like racing and winning. I don't care if I am running 10.90 (seconds) in Stock or 7.90 in Top Dragster," Bertozzi says. With both Bertozzi and his wife as active drag racers, it would be easy to assume that daughter Brittney, 21, would also be interested in competing. But, says Bertozzi, despite a pair of attempts to put his daughter behind the wheel, the younger Bertozzi has not yet taken to racing down the quarter mile. "She loves the beach but she likes to go to some national events and hang around," Bertozzi says of his daughter. A few years ago when his daughter was younger, Bertozzi bought his daughter a junior dragster so that she could get started in racing. But, he says, so many family members would show up to watch Brittany race that she became uncomfortable. Several years later, Bertozzi and his daughter tried again. This time, Bertozzi says, he brought in fellow racer Jim Harrington, who also operates a driving school, to teach Brittney how to race. Shortly afterward, Brittany entered a race at Maryland International Raceway in Budds Creek, Maryland where she went to the fourth or fifth round of eliminations before she lost. Bertozzi occasionally races at NHRA national events and NHRA points races, but says that he prefers racing in the IHRA series because the shorter schedule is not as grueling and, most important, he prefers the way the Ohio-based sanctioning body runs its events. At IHRA events, he says, "the staff and the people make you feel like they want you and they need you there, adding that he believes that fans who attend IHRA national events are more interested in Sportsman racing than those who attend NHRA national events. "They get a lot more grass roots racing fans at IHRA events," he says, explaining that more fans stay in the stands to watch the sportsman racers instead of leaving the stands to walk through the pit area. "I love IHRA," Bertozzi concludes. "I like the people and the attitude."